Can You Dye Fabric on a Chair? There are several options for updating the look of old upholstered furniture. Reupholstery is worthwhile on a good piece of furniture but is often costly. 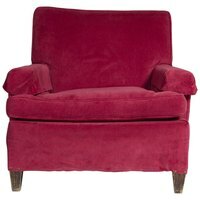 Slipcovers are popular but may be difficult to find for some chair styles. If your upholstery is in good shape, recoloring the fabric to match your decor is one simple and inexpensive solution. Natural-fiber upholstery fabric will absorb and retain dyes, but they must be removed from the furniture before dyeing. Unless you plan to disassemble and reassemble your chair, dyeing is an impractical option. Fabric paint, which contains dye suspended in a colloidal base, may be used on a variety of fabric types, including nylon, polyester and blended-fiber fabrics. Home-use fabric dyes are typically manufactured for use on clothing and fabrics that may be soaked in constituted dye solutions. Residual dye must be thoroughly rinsed from the fabric and dried to prevent transferring of the dye onto skin and clothing. Natural fabrics such as cotton, linen, rayon and wool are the best candidates for effective dyeing. Upholstery fabric made of man-made fibers such as nylon, polyester and microfiber resist absorption and retention of home-use fabric dyes. Fabrics that have been treated with stain-guarding preparations are also poor candidates for dyeing. Prior to dyeing natural upholstery fabrics, the fabric panels must be carefully removed from the chair to prevent tearing. According to the manufacturer's directions, the concentrated dye is reconstituted in a large container. The fabric is placed in the dye solution and is periodically agitated. The dyed fabric must be rinsed and dried before reupholstering the chair. Specialized flexible, colorfast spray paints are available in a wide variety of colors for painting upholstered furniture. This method does not require disassembly of the furniture. The furniture is placed in a well-ventilated area, and drop cloths are used to prevent overspray from damaging surrounding floos and walls. Portions of the furniture that you wish to remain unpainted are masked with tape and newspaper, cloth or plastic sheeting. The paint is applied in light, broad passes. Multiple coats may be required for satisfactory coverage.